These are two photos of firstly my great-grandfather James Henry Murphy born 1892 (or at least I think it is... I will have to double-check with my Grandparents, sorry ). Second is my great-uncle James Henry Murphy born 1920. I was told he was a chef? 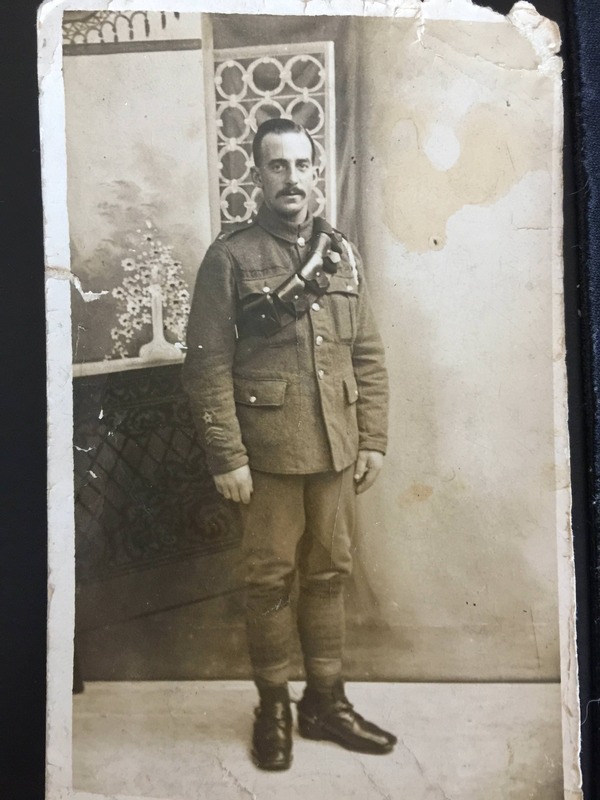 I'm hoping anyone can identify the uniform or cap badge that he appears to be wearing. I don't see much insignia in either photos so I'm doubtful anyone will be able to help but thought I would post this anyway. Any help is appreciated. Hopefully a moderator can add this to the first post and delete this one. Sorry, I screwed up the format of the code. At first glance the first man's 1903 Leather Bandolier indicates a cavalry, artillery or mounted infantry unit. Thanks for the reply SemperParatus. I know where they lived Colchester, Essex for the first picture and Southend-on-Sea, Essex for the second. I understand the lack of information, I tried to find service records but could not find anything for either online. Ok RE the belt, I did not know that, that's a start! I was able to find the service record for the first man, he was my Gt Uncle. and his name was George. It says his reg. name was HC Divl Signal Co RE. I'm not sure what that means, I assume Signals. He was born in Brighton, Sussex and the title of the form is Territorial Force 4 years' Service in the United Kingdom. Your second man seems to have a grenade emblem on his Field Service cap. If so, that suggests either the Grenadier Guards, or a fusilier regiment. I am not sure but I believe the Guards wore a khaki Service Dress cap (i.e.1914 style) rather than the khaki 'Cap F.S', when not in the field. If I am seeing right, the emblem does closely resemble the grenade badge of the Royal Fusiliers (City of London Regiment). So that might be a possibilty. Hi jf42. Thanks for taking the time to write this up, I appreciate it. Can you explain why you say he was a driver of company transport/or specialist role? He was born before 1890 and was 26 when he joined in 1913 according to his TA 4 years form so you are probably right about the fitness part. I'm not sure about the stripes, I thought they meant rank in the army? Also where it says "Have you ever served in the Army...? etc" it appears to say "1st Sussex RE." "Completion of Volunteer service", so that must be for the star you are mentioning. His reg.no. was 1115 which matches with these lines in a document I found online. 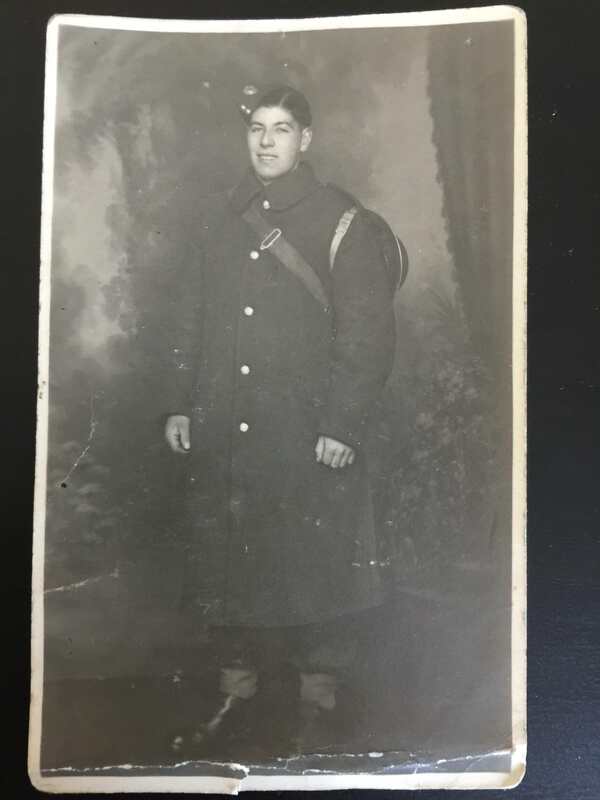 The second man is the Nephew of the first man, he was born in 1920 and we know he did something in WW2, my Grandma says he was a chef but I'm not sure if she is correct or not - I'm still trying to find out. Maybe he was Grenadier Guards or Fusilier regiment in WW2? If those existed during that period, that is. Badges of rank. Chevrons indicating rank would be larger and on the upper arm. For other ranks, all marks of service were on the forearm but that is an area in which I am otherwise almost wholly ignorant, although I believe a star is for five years service as a Volunteer. '1 Sussex RE' , strongly suggests 1st Bn Sussex Regt, but for the fact that it was a Regular Battalion , the regimental title was 'Royal Sussex' and that the battalion had been abroad since 1896 and did not return till after the Great War. Perhaps there was a territorial Royal Engineers company affiliated to the county of Sussex, but that takes me far out of my comfort zone. The first man's sleeve insignia appears to me to be Overseas Service Chevrons with a "Driver" Proficiency Badge above it, which would be consisted with his mounted uniform.